Well, remember how we said that some cars are never finished, and are on a constant evolution to improve? WELL, this ‘69 is back in the shop for some upgrades once again! This time, the owner wanted to change the personality of the car a bit and move from the angry 540 Big Block Chevy into an LT4 supercharged power plant for a more refined - but still powerful - driving experience. We started the engine removal process by protecting the car with a Badass Fender Cover… which should be called a nose cone, to be honest. We measured the spacing on the hood to fenders and valance for reference, and then removed the hood. All the engine fluids were drained, exhaust was disconnected, wiring harnesses disconnected… all the usual items required for engine removal. Out came the big Chevy engine. Tyler experiences DejaVu on this car, recalling the first time the engine came out of the car before the big suspension overhaul! 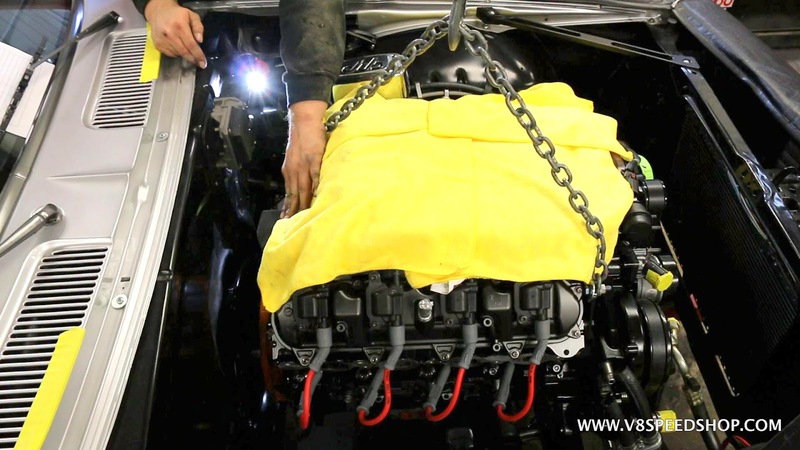 The Chevrolet Performance LT4 V8 engine arrived on a pallet from another shop, where it had been painted black and upfitted with an underdrive pulley system to generate more supercharger boost pressure. The wet sump oil system tank is also visible on the pallet in this shot. These generate around 640 horsepower and 630 lb. ft. of torque, but the mods on this one will ensure more oomph than that. The LT4 features direct-injection, and it comes in the Z06 Corvette in regular production trim. Here the Drive Junky LT4 front accessory system is visible. Time for a quick test-fit of the LT4. We had recently installed a new Centerforce DYAD clutch and flywheel on our 540 big block Chevy engine but we wanted to run a Centerforce DYAD clutch with the LT engine as well. However, the LT flywheel would be different. Rather than install the new flywheel with a used clutch and split up the set, we elected to obtain a new flywheel and DYAD DS clutch from Centerforce for the LT engine, and offer the matched clutch and flywheel from the big block for sale. The Centerforce DYAD DS is a thing of mechanical beauty. The machined flywheel is nearly too nice to hide inside a bellhousing! BUT… it wouldn’t do much good on the bench! ARP hardware holds it to the LT4 crank. You’ll notice some pink / red dots on the components… these are alignment markings provided by Centerforce. This system was balanced at the factory, and they are kind enough to place the parts in the box all ready to go. However, if you seperate them, you can realign the parts using the dots to during installation so they remain in balance. The DYAD part… the 11” clutch disc and the “floater” dual disc assembly. Centerforce claims these will hang on to up to 1300 lb. ft. of torque while still being able to drive comfortably. We’ve found the driveablility claim to be true in several high-hp cars, including this one with the 540. These units provide predictable “grab” with smooth engagement and a pedal you can live with. The pressure plate and clutch plates mounted to the LT4 with ARP studs. The alignment tool is still in place in this shot. The pink dots correspond with the dot on the flywheel. The cad-plated ring is the front half of the explosion-proof scattershield. Hydraulic throw-out bearing on the input shaft of the T56 Magnum 6-speed transmission. The SFI spec bellhousing attached to the front of the transmission. We lowered the LT4 into the nose of the Camaro and shot a quick video. Excuse the quality, this is from a V8TV “Minute To Winnit Live” video we streamed on our Facebook page. Pics of the fit and some new surprises next time! Last Edit: 04 Feb 2018 14:11 by oestek. 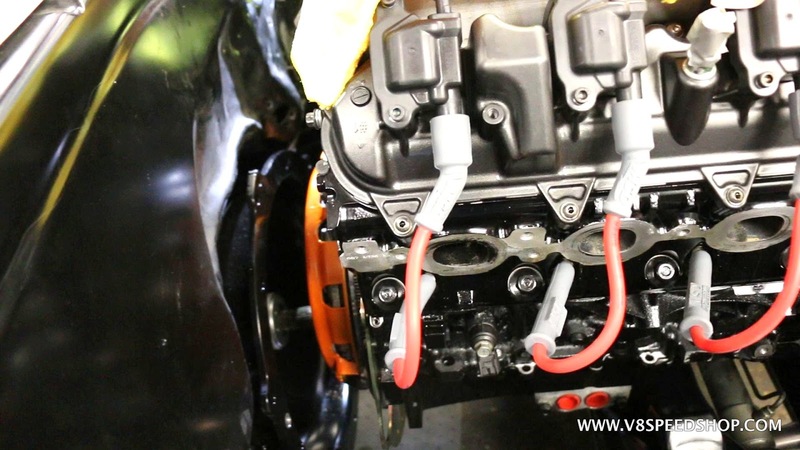 There are numerous connections off the back of the LT4 that require some space to access and make them look clean, as well as for serviceability. The V8 crew lowered the engine into the bay just to get a visual of how things were going to fit. This car had a smoothed firewall, and A/C bulkhead fittings down on the passenger side. The motor mounts had not yet been chosen, this was just to get a bird’s eye view of any potential challenges. It was obvious that there would be some clearance issues on the back side of engine as the assembly moved closer to the transmission. The engine was lifted out, and the firewall was examined. At this point, the team noticed that the existing firewall was showing some cracking bodywork and would require a fix and repaint regardless. The decision was made to modify the firewall to better accommodate the new engine and fix the surface issues. In order to do this, the front sheetmetal was to be removed. The team carefully measured and recorded the gaps, spacing, and fitment of the panels and the alignment so that everything would go back together properly.